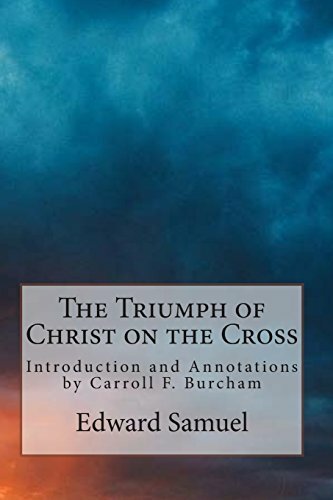 Synopsis: This treatise on the Cross of Christ lists the benefits of the Atonement of Jesus in the lives of those who place their faith in Him and what he has done for them. The emphasis is found in these Scriptures: "FOR I DETERMINED NOT TO KNOW ANYTHING AMONG YOU, SAVE JESUS CHRIST, AND HIM CRUCIFIED." 1 Corinthians 2:2 "I AM CRUCIFIED WITH CHRIST." Galatians 2:20 "GOD FORBID I SHOULD GLORY, SAVE IN THE CROSS OF THE LORD JESUS CHRIST." Galatians 6:14. Edward Samuel writes in his preface: "This little work is not intended for the learned or wise of this world; but for the poor of Christ's flock, rich in faith, and heirs of a kingdom. It is for those who are brought up in the school of Christ, taught by His Spirit, feeling the plague of their heart, and knowing what a daily conflict is. It is for the doubting and fearing believer; the bruised reed and smoking flax. Such souls I hope, through Divine blessing, will find encouragement in perusing it. Herein will be found doctrine, experience, and precept; in a word, a brief summary of the whole gospel." About the Author&colon; Edward Samuel tells of his birth, of his parents and his extended Jewish family, of his trip to England to avoid mandatory service in the Russian army, of his account of his conversion from Judaism to Christianity, and of his Christian ministry. He begins by writing, "I was born in a small town, called Vinooty, in Russian Poland, on the borders of Prussia, on the 14th of the month Nisan, 1812, on the evening before the Passover." He continued in school until he was sixteen years old when he was forced to leave his home. In London, Edward Samuel met a fellow Jew from his homeland. Edward Samuel learned that his new acquaintance had converted to Christianity and who influenced him to become a Christian. On December 24, 1837 Edward Samuel was baptized and was received as a member of the Church of England at the Episcopal Jews Chapel, Cambridge Heath, London by J. P. Cartwright. Before long he felt the urge to preach. He continues: “The Word being received at Farnham on my first visit, I was invited again, and preached in the same place, as there was no place of truth in Farnham. After great conflict of mind, I accepted Leicester. During the first twelve months I was very much tried in mind as to whether I had done right in going thither; but, seeing things comfortable, I endeavored to settle myself.